In recent decades, the name “red velvet cake” has been applied to almost any vaguely red cake. Many of these impostors taste nothing like the real thing. Below is my favorite version – it’s based on the most original old recipes I could find. A true, classic Red Velvet cake recipe, the way restaurants in the South used to make it. 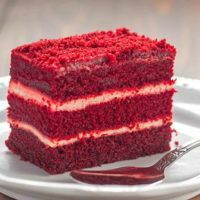 Red Velvet cake should be lightly sweet and lightly chocolatey (so light that it’s hard to identify the cocoa flavor) and very moist. The icing should also be lightly sweet, not coated with coconut shavings or powdered sugar, with either a buttercream icing – by far my preference – or a cream cheese icing. If you’ve never tried a red velvet cake recipe with buttercream, you really should. Cream cheese dominates the cake’s flavor, in my humble opinion, while buttercream complements it. You’ll be surprised that the recipe calls for beet juice. But the cake was invented before food coloring was, and you can certainly use food coloring instead. The beet juice doesn’t add flavor to the cake – just sweetness. Much of your grocery store sugar is made from beets in the US. My preference for a Red Velvet cake recipe is a single-layer. First, it tastes better. Layers need too much icing, and even buttercream icing overwhelms the delicate cake flavors when you use that much. Second, I’m lazy, and it’s easier. 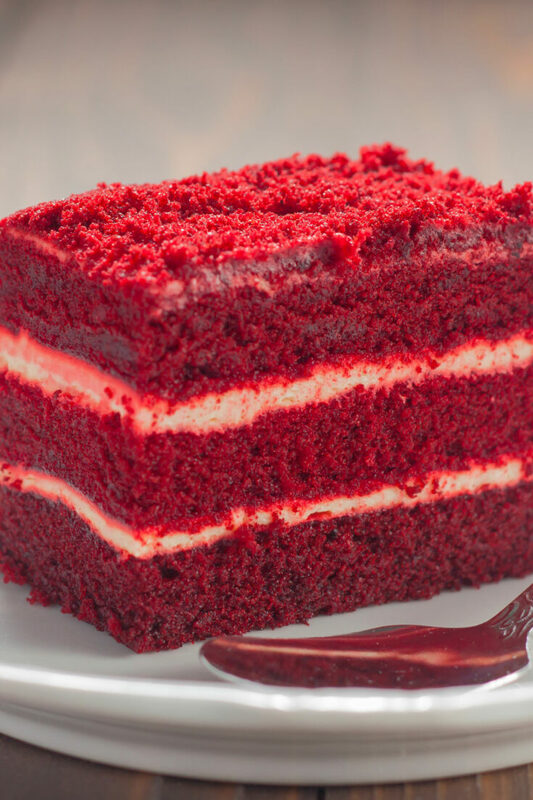 While most people think you need to be fancy and make a layer cake, classy old-school Southern restaurants know: a single layer red velvet cake is fabulous. But you can make this recipe in layers if you want. Just repeat the steps for each layer. Traditionally, you don’t decorate the cake in any way. You just have this pretty white smooth cake, and if you serve it to someone else, the red interior is a complete, delicious surprise. If you really want to add a sprinkle of something to it, I suggest cocoa powder. I would not add any sweetness to it. Some people add coconut shavings, but I think that clashes with the other flavors. Some people add nuts, and that works pretty well. But really, it’s best just as it is. This classic, old-school recipe for Red Velvet Cake has the best flavor. Part of the magic is the icing (see below) and part of it is the cake itself. Preheat your oven to 350 degrees. Make sure all your ingredients are room temperature before you start. Mix the beet juice and cocoa powder together in a smaller bowl until it forms a thin, smooth paste. In a large bowl, beat the butter and sugar together for 2-3 minutes, or until the mixture is fluffy. Beat an egg in next, and then the other egg. Beat in the vanilla extract and the cocoa paste. Add a third of your flour mix to this mixture and beat it well. Beat in half the buttermilk, followed by another third of the flour mixture, and then the rest of the buttermilk. Finally, beat in the last third of the flour mixture. Mix vinegar and baking soda together in a small bowl (it'll fizz, so don't use too small a bowl). Add this vinegar mix to your cake batter and stir well. Pour the mixture into a cake pan and bake it for about 20 minutes. If you can pat the top and it springs back up, it's done. Let it cool before frosting. Note that all the sweetness in the cake is coming from a cup of sugar and some beet juice, and the icing – which is where a lot of recipes get too sweet – should be only lightly sweet. This buttercream icing is sweet and rich and perfect for red velvet cake. It also works with lots of other types of cake, too. Cook the flour and milk together over medium heat until the mixture thickens. While that cools, cream your butter and sugar until it gets fluffy. Combine that with the cooled flour mixture and add the vanilla extract. That gives you a light, buttery icing instead of the usual cream cheese. 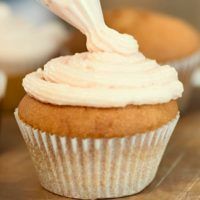 I have made your exact recipe for years, but the last couple of times when it comes to the frosting, I run into trouble. The frosting curdles! I have tried every technique that I can find and nothing seems to work…any ideas? Is this recipe for a single layered cake or for a three layered cake? I read what you wrote, but I enjoy making three layered cake, and wondering if i need to triple this recipe in order to do a three layered cake. Otherwise this recipe sounds exactly what i’ve been looking for. A simple red velvet cake that is lightly sweet and lightly chocolately. Thank you for posting. Tai, it’s for a single layer. I think simply tripling the ingredients and then following the usual procedures for stacking the layers would be all the adjustment you need to make a triple!